Resolutely seaworthy and incredibly spacious, the First 35 Carbon Edition has an unbeatable level of equipment and design in her class. 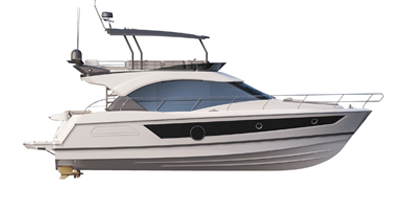 She comes equipped with a carbon mast, lead keel and composite multi-position tilting steering wheel. Designed by Farr Yacht Design, the First 35 hull has taut lines accentuated by her particularly elegant hull and roof decoration. The huge cockpit, mainsheet traveller further aft and ‘German System’ make life on board safer and easier. The long draft lead keel promises outstanding performance. Built not only to perform, the interior is an elegant contrast between the cerused oak flooring, light-colored upholstery and classic teak woodwork. Ample space below deck allows two spacious double cabins, a fully-fitted L-shaped galley opposite the chart table and salon equal in size to that of the First 40. Constructed to win regattas, the First 35’s superior strength stems from her intentional design to be handled with ease; a reassuring fact for small crews or family sailing. Innovative in more than one way, the tilting steering wheel can be moved on tacks to provide optimal visibility of the sail trims while improving maneuverability around the cockpit. 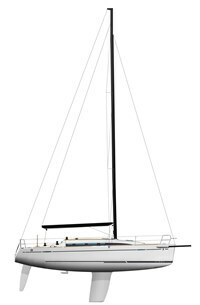 The retractable carbon bow sprit makes hoisting the asymmetric spinnaker much simpler. With high-performance goals, the chosen materials, such as the carbon mast, rod rigging, fiber adjustable backstay, and rigid boom vang were selected for being lightweight and strong. Forward cabin has 3 hanging lockers and coaming compartments. Foam mattress with fabric cover (6'6" x 6'4" x 2'1"). Aft cabin with large berth (6'49" x 5'8" x 4'9" ).